We are very excited about the increase in consumer demand for locally-produced olive oils. 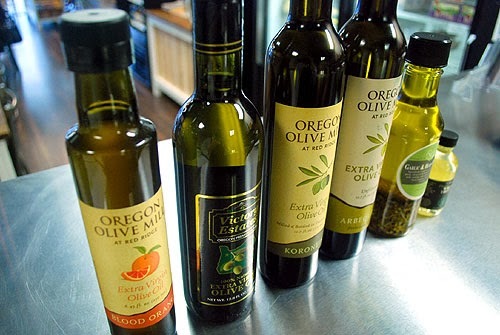 Oregon is home to two excellent olive oil producers, Victory Estates and Oregon Olive Mill, both of which use olives from their own groves, supplemented by fruit from growers in Northern California. What makes these olive oils unique from a culinary perspective is that they highlight specific olive varieties, each with its own distinct flavor and aroma. Preparing food with these oils is a real treat for the senses. At Rafns', we like to prepare tasting notes on many of the products we carry in the store. The following descriptions provide just a brief introduction to our local and regional olive oils. Be sure to visit the store to try samples. We always have open bottles in our deli, and we're happy to make recommendations on how to use them! Since 2002, Larry and Dawn Monagon have been growing olives on their small farm in Keizer, Oregon. They primarily grow Arbequina olives which they mill on-site. Victory Estates extra virgin olive oil is known for its sweet, fruity taste and buttery finish. The Oregon Olive Mill was completed in the fall of 2008. Their olive groves cover 17 acres and include 13,000 olive trees. The varietals planted thus far include Arbequina, Leccino, Mission, Pendolino, Koroneiki, and Picual. Arbequina - Named after the town of Arbeca, Spain, this versatile olive is now grown in many parts of the world. Oregon Olive Mill's Arbequina oil is smooth, nutty, and buttery, with a mild pepper finish. Koroneiki - Native to Greece, the Koroneiki olive produces a fruity oil with notes of arugula and black pepper. Tuscan - The Tuscan oil is composed of Leccino, Frantoio, and Pendolino olives. It has a robust, pungent, and earthy flavor with a nice peppery kick. Blood Orange and Lemon - Fresh citrus is added to the milling process to impart a fresh and lively flavor. The Joel Palmer House produces this oil with fresh white truffles, foraged right here in the Willamette Valley. They use a refined olive oil, which is lighter in taste and color, allowing the truffle flavor to shine. We created our dipping oil using extra virgin Arbequina olive oil, fresh sage and rosemary, Pecorino Romano, and lots of fresh garlic. It works well as a finishing oil or for dipping pieces of freshly-baked bread. We recommend adding a pinch of kosher salt for extra flavor!